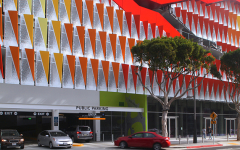 The City of Santa Monica’s new state-of-the-art parking structure integrates requirements from ‘The City of Santa Monica Green Building Design and Construction Guidelines,’ and has earned LEED® Gold certification. 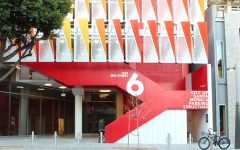 The parking structure is set back 20’ from the street to allow for increased pedestrian activity. The site includes 7,000 SF of retail space which creates an impressive allglass, 18’ storefront façade. The structure also includes 30 electric vehicle charging stations, an enclosed bicycle area, and storage space for the Farmers Market. The design incorporates a dynamic façade with lightreflecting triangular panels carefully crafted to direct light into the structure. These varied-angle panels are supported by a vertical perforated piece to capture sunlight as it sweeps across the façade. Weaving through the panels is a “cascading stair,” located along the front edge of the building, allowing ever-changing views of the city and nearby ocean as visitors ascend and descend the stairs. 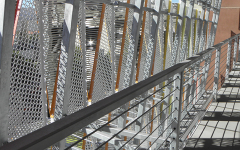 A pedestrian walkway runs the entire length of the structure at each level to allow access to the cascading stair. 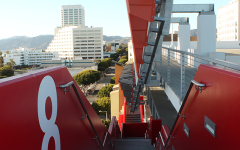 Also located on each level is an additional pedestrian orientation element in the form of a “red carpet” painted on the floor that extends into the drive aisle and provides a visual clue to the location of the cascading stair landing. 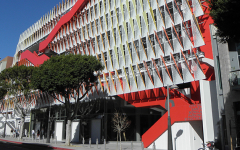 As Architect of Record for this award-winning design-build project, IPD developed numerous plan layouts to explore various circulation and ramping systems, and to optimize the roof-top photovoltaic array.